Christmas is coming soon and it’s fair to say I’m pretty excited, it’s quite possibly my most favourite time of year. Not because of the gifts (I don’t need much), a little because of the food (I love a Christmas feast), and a lot because I get to enjoy time with my family, but most of all because of what it brings. In Australia, Christmas conveniently coincides with summer. I love summer in Australia, It’s hot, like really stinking hot! The kind of hot where the roads melt and stick to your sandals (we call them thongs in Australia), the kind of hot where you can feel the sun biting into any piece of skin that hasn’t been lathered in sunscreen, the kind of hot that makes you lazy, sleepy and totally unmotivated… I love it! It’s the perfect weather for going to the beach, lounging by a swimming pool, wearing shorts, drinking beer and enjoying the huge array of sports that appear on television just for your summertime enjoyment. Doing nothing is awesome, but what has it got to do with wealth creation? I know that there are reasons to do some of these things. Changing jobs might be in your interest, you may need a new car because the last one stopped working, your family may have grown or contracted to a point where you need a new home and let’s face it, we all like having a few things that we don’t really need. The point is that most people do too much of this and need to learn to do less. You can’t go anywhere these days without someone trying to sell something to you and sometimes it can be very hard to resist. The only remedy for this is self control and sticking to a budget or spending plan. Not buying sh#t is a great way to retain more wealth, but sometimes its nice to treat yourself too. Find the balance and it will get easier. Sometimes this is necessary, I’ve done it quite a few times for various reasons and you shouldn’t let it hold you back from achieving more by not doing it. The best case scenario would be moving to a situation where you are working for yourself to grow your own wealth. The alternative is to do something that you love which will allow you to grow within an organisation and most importantly keep learning. People that are serial job changes generally have a lot more trouble at creating wealth as they often lack the patience to see things through. I touched on buying new cars in a recent post about servicing your wealth. I like new cars, they smell nice and are fun to drive, but I just can’t bring myself to buy something that looses up to one quarter of its price as soon as you get in it! I am glad that there are a lot of people that do like doing this however, as it means that I can buy an almost new car for a lot less money. For some, cars are a status symbol and they feel better about themselves in the latest and greatest. If you can really afford to do this then good for you, try and keep it for as long as you can. If you can’t really afford it or are just trying to impress everyone else, then you might want to rethink your wealth strategy. This is a big deal for most people. Although some make a living from it, it can be an expensive process that could cost you thousands over your lifetime. If you do this for a living, then well done, I’m a fan of your work! If you don’t do it for a living, then have a really good think about selling and buying before you decide to do it. It can often be cheaper to renovate your existing home to get what you want. If you do need to buy a new home, then consider keeping your current home as an investment rather than selling it and losing a potential income stream forever. Doing nothing by practicing patience can be a great way to improve your wealth, but sometimes you have to do something as well. As it’s getting close to the end of the year, I don’t want you to work too hard so I would simply suggest thinking about what you want your wealthy life to be and how you are going to achieve it. 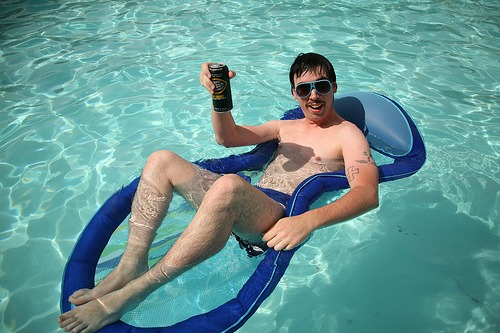 Don’t tax yourself, do it drinking beer by a pool or sipping wine by a fire (if you live on the other side of the world). 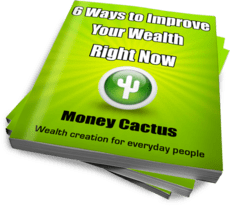 If you need some helpful resources to get you thinking, you might like to subscribe to the Money Cactus RSS feed, or fill out the form in the side bar to join my mailing list and get my free eBook.